Slack on the reports I know but I have just had no time to update. The fishing has just been stunning over the past couple ofÂ weeks and thanks to you guys I have been out most days somewhere. Over the past couple of weeks I have done nearly all my work on the TongariroÂ as there seems to be sooooÂ many fish trickling through here everyday. All the websites are right, its red hot!! 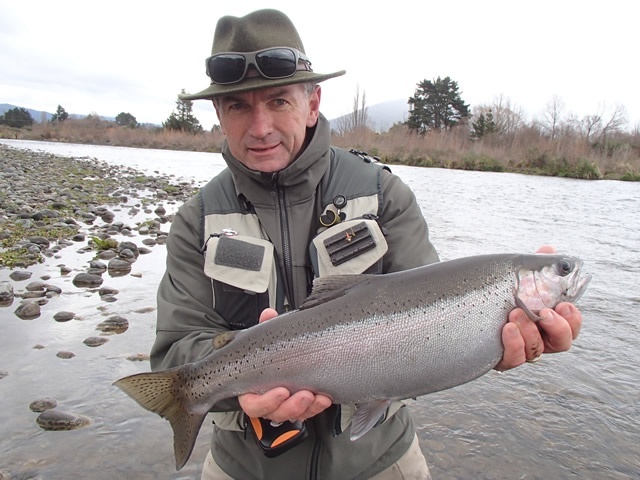 If you are not catching fish at the moment you are doing something very wrong or have no fly on. I have also taken a couple of hunting trips into the private block which have resulted in a kill on both occasions which has been a nice change. There are two rivers currently in Taupo which are firing and that’s the Hine and the mighty Tongariro. The Hine is loaded with trout currently and received a small but good run of trout after this weeks rain periods. Generally they are recovering or dark fish in here and nearly all above the bridge up to the Cliff pool. I would be using summer style flies with light leader to ensure regular hook up’s in here. If you are looking for silver bullets with plenty of power look no further than the Tongariro-it’sÂ back!! I have guided most of my sessions down there and caught between 10 and 20 fish every day. I’m not the only one catching, all anglers seem to be enjoying similar catch rates using all methods and all flies. I think the best at the moment are small naturals asÂ the rocks are so covered in slimeÂ and low water conditionsÂ but on the right overcast rainy morning the glo bugs have worked just as well. Fish condition are amazing, the best I have seen for the last 5 years anyway. Please be picky with what you kill, there are plenty to choose from so select the best fish to suit you and the best for the fishery. There are a lot of hens in the fishery with really fat guts full of roe, let these go as they are quite often thin on the sides and goodness has gone into the very ripe eggs. If you are looking for a great fish to smoke crack into one of the larger jacks which will have thicker flanks and better coloured flesh. Angling pressureÂ is extreme, you will be fishing with many others there is no escaping. The upper river will be slightly quieter than the lower reaches but if you are fishing the weekend you might just have to get used to seeing another fisherman close by. Angling etiquette has been average from what I have seen, success of some anglers has gone to their heads and sharing is not a skill they were taught. In saying that there are some really nice anglers out there as usual. Thankfully , I will be out for the full week next week and I’m sure to see youÂ somewhere on the river. If you have some sick days left up your sleeve or have a favour to call in now might be a good time??! Let me know if I can help withÂ any guidingÂ queries.